While Good Answers Apologetics Presentations are designed as individual, stand-alone explorations of specific topics, they can be used to create a one-credit High School course for your teen. This Apologetics Suggested Syllabus can serve as a guide for creating a course that fits your homeschool. In this document, Dr. Culley shares as a sample the syllabus he created for just such a class that he offers at an umbrella school in DE. You will need to fit the dates to your calendar for the year, of course, and make decisions about the precise way in which you will structure the course. If you choose to have your student take a Mid-Term and Final Exam, you will need to create those yourself. You might consider having your student tie some of his/her writing (essays, research papers, creative writing, personal reflections, etc.) to the material being studied in this course. 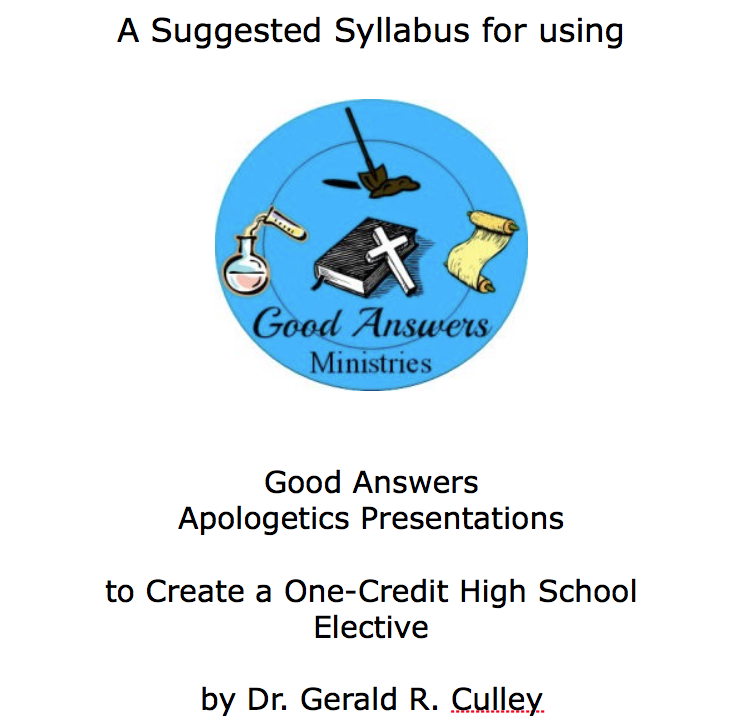 For a complete list of Apologetics Presentations from Good Answers Ministries available for download (.ppt Powerpoint slideshow, .pdf slideshow narration, and .mp3 sound file) click here. To stream Dr. Culley’s presentations on his YouTube channel, click here. 7SistersHomeschool.com is thrilled to be able to share with you Dr. Gerald R. Culley’s Good Answers Christian Apologetics Presentations – at no cost to you, now and always! Dr. Culley has a ministry to young believers. Statistically, they are at risk: two-thirds of them will leave the church by age 20, largely because of secret doubts about the Bible. He offers a series of PowerPoint voice-over lectures on how archaeology, history and science support our faith in Scripture.